As most likely every admirer of cinema, I can completely immerse myself into a great film. When I have seen what I consider a masterpiece, however, I find myself stuck in its wonderful captivity. For a few hours, sometimes for days, its atmosphere can determine how I view the world. I even unconsciously adopt some of the characteristic quirks of the actors I’ve admired most in the film. After several years of writing on the art of cinema, I can now usually state what exactly caused this unique feeling in me. I have learned to analyze and dissect narrative and stylistic structures. Ironically, “Ugetsu Monogatari”, the essential piece of art that revealed to me the power of cinema, remains almost inscrutable to me until today. “Ugetsu Monogatari” is considered one of the great masterpieces of legendary Japanese director Kenji Mizoguchi. Made three years before Mizoguchi’s premature death of leukemia at the age of 58, it was part of a series of outstanding late works of the old master. On its introduction in the West, “Ugetsu Monogatari” received universal acclaim and even won the Silver Lion at the Venice Film Festival. 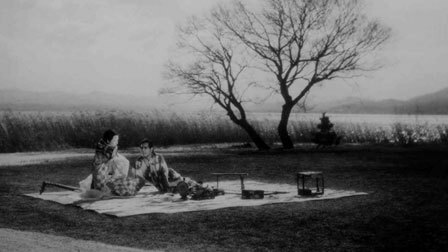 Today we know that “Ugetsu Monogatari” was not necessarily one of Mizoguchi’s most personal works. In the prewar era, Mizoguchi had risen to fame with his unflinching contemporary social studies. His protagonists were fallen women on the edge of society. Geisha and prostitutes, whose tragic oppression in a male-dominated society the master analysed with great astuteness and sincere compassion. His greatest works of the 1930s include such films as “The Water Magician” (Taki no shiraito, 1933), “Osaka Elegy” and “Sisters of Gion” (Naniwa ereji and Gion no shimai, both 1936). All of them grounded and realistic studies, located in the modern era of Japanese history, which were given a hint of transcendence by the picturesque elegance of Mizoguchi’s camera . When Mizoguchi began to work for the Daiei production company in the early 1950s, the Japanese film was about to conquer the international festival market. In the early 1950s, Akira Kurosawa’s “Rashomon” (1950) had introduced Japanese cinema to the West and during the following decade of Western recognition, more and more Japanese films managed to win big prizes at the world’s most important film festivals. But the interest of Western critics in the Japanese film was often aimed solely at the latter’s supposed exoticism. Socio-critical films in contemporary settings were neglected, instead mostly period films gained praise, which mesmerized the Western audience with the splendor of their colors, their elaborate costumes and archaic customs, even though their content mostly was just about average. Daiei company boss Masaichi Nagata was the man who perhaps exploited this Western tendency of assessing films, more based on their “foreign” exoticism than on their cinematic quality, most effectively. After the Daiei produced “Rashomon” had won the Academy Honorary Award and the Golden Lion in Venice, Nagata produced films which were specifically targeted at the western market and catered to the Western thirst for elaborately mounted period films. His strategy proved successful. 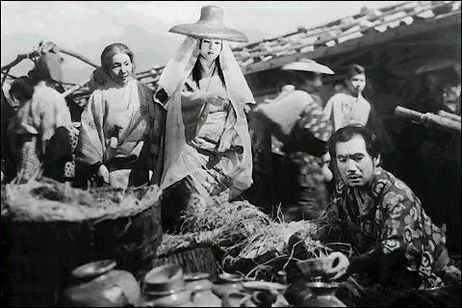 In 1951 Kozaburo Yoshimura’s “A Tale of Genji” (Genji monogatari, 1951) won a technology award in Venice. Three years later, Nagata even surpassed this success when “The Gate of Hell” (Jogkuemon, 1953) was awarded the Palme d’Or at the 1954 Cannes Film Festival and, one year later, two Academy Awards (again the Academy Honorary Award and “Best Costume Design”). Two films whose merits can be found more in their gorgeous cinematography than in their formulaic narratives. In this respect, it can be assumed that “Ugetsu Monogatari” as well was produced with a keen eye on the Western festival market. Evidence of such is hidden in the elaborate recreation of a bygone period and the magnificent scenery and costumes, rather trademarks of the Daiei produced festival films than those of Mizoguchi, and in the notably literal supernatural elements of the film. Ghosts were immensely popular among the domestic Japanese audience in the form of the kaidan eiga (“Ghost film”). However, in the usual kaidan eiga, especially those of Nobuo Nakagawa at Shintoho, the ghosts are only visible to those they haunt and never directly harm their victims and thus, their appearance can usually be interpreted as a psychological manifestation of the guilt of the protagonists. In contrast, many successful Japanese festival winners possess a relatively literal sense of the supernatural which the ordinary Japanese film usually lacks. Examples include, the seeress in “Rashomon”, the eerie appearance of the female ghost in “Throne of Blood” (1957) or the always present, if toned-down supernatural elements in “A Tale of Genji” (Genji monogatari, 1951) and “Samurai” (Musashi Miyamoto, 1954). “Ugetsu Monogatari” takes these supernatural elements to their most literal. Mizoguchi managed to create a magical world where the encounter of a spectral being may be rare, but is always possible. 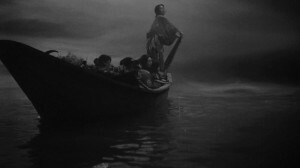 However, Mizoguchi grounded this unique kind of spiritual transcendence by juxtaposing it with the gritty realism of the calamities of civil war. Nevertheless, it must be noted that, in spite of this nods to the Western market, “Ugetsu Monogatari” manages to be as Mizoguchi-esque as any other of his films, at the same time enchanting fairy tale and critical social commentary on the situation of women in the medieval times of Japan. The film’s narration takes on the simple, yet profound form of a parabola. Situated during the Sengoku era, a turbulent period of civil war and social unrest, it tells the story of two farmers, Genjuro (Masayuki Mori) and Tobei (Eitaro Ozawa), and their wives. Genjuro is an exceptionally talented potter who wants to sell his goods in the big city. There, he attracts the attention of the mysterious Lady Wakasa (Machiko Kyo). Soon she proves herself to be an evil spirit and Genjuro slowly loses himself in her clutches. Tobei, on the other hand, dreams of becoming a mighty warrior. During the war he unexpectedly rises to fame and his dream comes true. However, both men forget their faithful wives who are plunged into misery by the troubles of war. While Genjuro gets caught in a dream world in the mansion of Lady Wakasa, his wife Miyagi (Kinuyo Tanaka) fights with her little child for daily survival. Meanwhile,Tobei’s wife is raped by a horde of marauding soldiers and tragically becomes a whore in a brothel. Structurally, “Ugetsu Monogatari” is a flawed film. Originally, Mizoguchi wanted to expand the storyline of Tobei, but his studio refused. The result is that while Genjuro’s story is dissolved in an epic finale, Tobei’s story suddenly ends abruptly after the newly become warlord meets his fallen woman again. However, this simple story also emits a great power. It is the contrast between the tragedy of war, which the women have to suffer, and the beautifully photographed scenes in the mansion of Lady Kae, which give the film a heartrending cathartic quality. 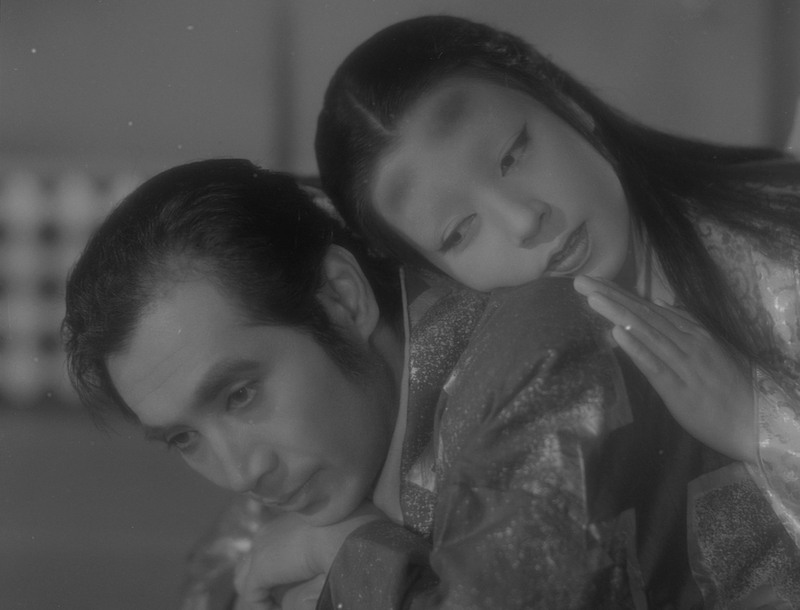 While Mizoguchi follows the lovely bantering of Genjuro and Lady Wakasa in the cherished garden with elegant camera movements, he shows the plight of the women who, surrounded by filth, crazed soldiers and violence, suffer a terrible fate. The most devastating scene for me, however, is the moment when Tobei achieves his long-awaited “glory” in the war. A samurai assists his wounded leader in the latter’s seppuku, the ritual suicide. He cuts off his head and moves away from the body of his companion, crying because of the loss. At this moment, Tobei attacks the samurai from behind, killing him in the process. He steals the head of the leader, which will bring him a splendid reward. A moment most unheroic and bitter. The whole injustice and tragedy of war in just one scene. In the end, both men experience a fateful reformation. They return to their humble peasant life. But despite of their big ambitions being shattered, the assurance that they are loved by their wives give them inner satisfaction. They became witness to a mysterious force that seemed larger than themselves and finally surrender to their fate. 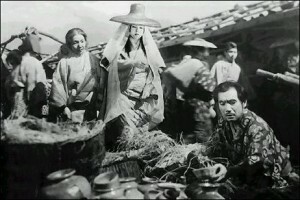 As Genjuro’s little daughter prays at the grave of her dead mother, the powerful classic soundtrack sounds and the camera rises above the grave site and reveals a view of the surrounding fields and houses of the village. Thus, “Ugetsu Monogatari” ends having put me completely under its spell. I was 15 then and have seen the movie many times since. But what exactly was it that resonated with me so strongly? Perhaps the beauty of master cinematographer Kazuo Miyagawa’s elegant camera work? Perhaps the perpetual presence of fate whose force seemed to control the actions of Mizoguchi’s protagonists? Or perhaps the nuanced performances of the actors, including such great talents as Masayuki Mori, Eitaro Ozawa or Machiko Kyo? While every one of these elements made quite an impression on me, there is something else that caught my attention. A kind of ungraspable force in between the gaps. A “cinematic glue” which connected these many different fields of excellent craftsmanship, from directing to acting to composing, to create a unique masterpiece. I believe it was this peculiar force of cinema, a sense of cinematographic beauty I had recognized for the first time in my life, which impressed me the most. But the exact definition of this power exceeds my mind until now. In order to better describe my ambivalent feelings towards “Ugetsu Monogatari”, I would like to paraphrase a quote of Akira Kurosawa. In his autobiography, “Something Like An Autobiography” (Gama no abura, Jiden no you na mono, 1981), Akira Kurosawa, quoting an essay by Japanese novelist Shiga Naoya, compares the nature of cinema with the shape of a dog. Focusing on a single body feature of the dog is insufficient to refer to the nature of the animal. In the end, like a dog is just a dog, cinema is just cinema. For me to ask about the power of “Ugetsu Monogatari” is to ask about the nature of cinema. I can analyze its beautiful camera work, name the effectiveness of its moral fable or describe the impeccable performances of the actors, but “Ugetsu Monogatari” is more than the sum of its parts. “Ugetsu Monogatari” is simply “Ugetsu Monogatari”. In other words, to talk about “Ugetsu Monogatari” means to talk about this vague and unreliable thing we like to call “The Magic of Cinema”.